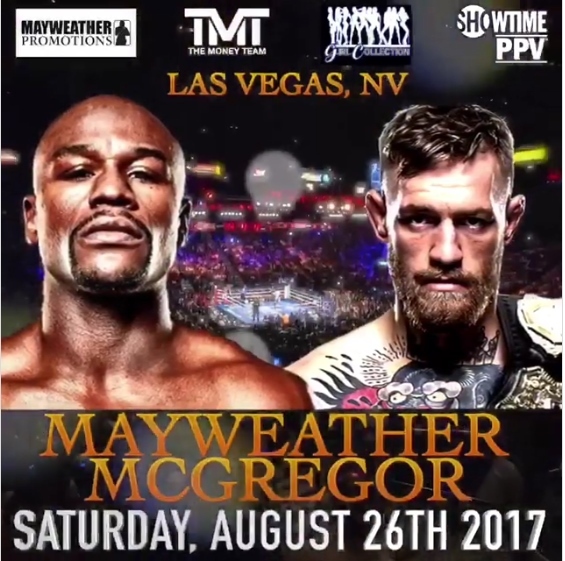 Floyd Mayweather Jr. vs. Conor McGregor has been signed for Aug. 26 in Las Vegas, Mayweather and McGregor both confirmed on social media. The fight will air live on pay-per-view. UFC president Dana White said Wednesday on SportsCenter that the fight will take place at T-Mobile Arena in Las Vegas and be contested at 154 pounds. Both fighters will wear 10-pounce gloves, White said. The hotly debated boxing match will mark the first time that a current UFC champion challenges a boxer in a boxing match. The fight, which will be sanctioned by the Nevada Athletic Commission, will be a professional boxing match, meaning if Mayweather wins, he’ll be the first boxer to have a perfect 50-0 record. It is expected to be the most anticipated “mixed” fight since Muhammad Ali vs. Antonio Inoki in June 1976. Mayweather Jr. (49-0), considered one of the greatest boxers of all time, announced his retirement from the sport following a September 2015 win over Andre Berto. However, he said recently that he was only interested in returning to action for a fight against McGregor. McGregor (0-0 in boxing, 21-3 in MMA), the current UFC lightweight champion, has never competed in a professional boxing match, but he is considered one of the best mixed martial artists in the world. He made history in November when he defeated then-lightweight champion Eddie Alvarez to became the first fighter in UFC history to be a champion in two different weight classes at the same time. Since then, though, the UFC stripped the Irish-born fighter of his featherweight title due to inactivity. Mayweather, 40, and McGregor, 28, have been flirting with the idea of fighting each other for almost a year, but things seemed to heat up after McGregor defeated Alvarez at Madison Square Garden late last year. For a while, though, the super fight appeared to be nothing more than a pipe-dream, but McGregor remained steadfast in his desire to challenge the undefeated boxer. “It’s the fight to make,” McGregor said in January. “It’s the fight the people want. It’s the fight I want. I know I’m confident going in there. In March, while in attendance to support fellow Irishman Michael Conlan in his pro boxing debut, McGregor erupted on the boxing media sitting ringside. “No one in this boxing game knows what’s coming,” he said. “Trust me on that. When I step in there, I’m going to shock the whole goddamn world. Trust me on that. Look me in the eyes. Twenty-eight years of age, confident as a motherf*cker, long, rangy, dangerous with every hand. While his purse has yet to be announced, McGregor is expected to make more for this one fight than he’s ever made in his career. Details of the deal have yet to be announced. It’s unclear at this time how much the pay-per-view will cost or who will fight on the undercard. The Nevada commission approved the Aug. 26 date for a Mayweather Promotions card Wednesday during its monthly meeting. At the time of the meeting, it was not fully known that it would be for Mayweather vs. McGregor. Previous Post WWE Planning a Kurt Angle vs. Triple H Match?